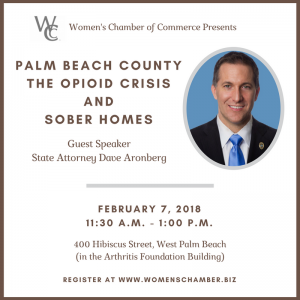 The Women’s Chamber of Commerce is proud to present a special educational program on the opioid crisis and sober homes in Palm Beach County. Please join us on February 7, 2018, for a luncheon event with State Attorney Dave Aronberg. Dave Aronberg was elected State Attorney for the 15th Judicial Circuit in November 2012 and was re-elected without opposition in 2016. He is a former Assistant Attorney General, White House Fellow, and Florida Senator. Aronberg recently appeared on NBC’s “Sunday Night with Megyn Kelly,” bringing national attention to Palm Beach County’s opioid crisis and the urgent need for regulation and oversight of the substance abuse treatment industry. Aronberg is a member of the Palm Beach County Sober Homes Task Force. Seating is limited. Reserve on the Women’s Chamber event page.